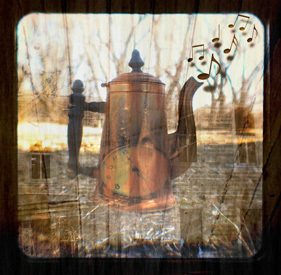 Vintage Inspiration Friday - Jill Ruth & Co.
Today, I saw this very lovely creation at Miss Lynn's blog, Create...Breathe, and thought it was spectacular! Isn't it just lovely?! She had been inspired by Sheila at Blessed and Distressed. A while back, I had saved this image on my computer...very sorry I have no idea where it came from. I just thought it was fun. Yeah, I know...another heart! So, tonight I pulled out all my red and pink spools of thread to form a heart too... just for fun. I am definitely inspired by spools of thread! 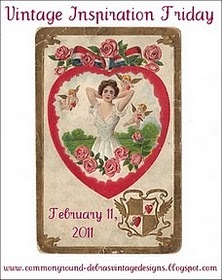 I'm linking up for the first time with Debra for Vintage Inspiration Friday's Valentine party. Goodness knows there is some wonderful blog hopping to do over there! A very happy weekend to you all! These are awesome images!!!! Reminds me of my grandmother's sewing things. 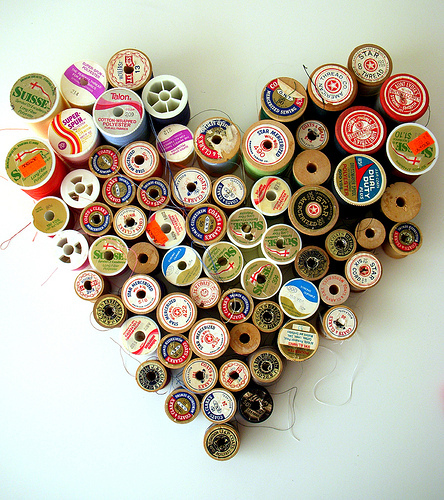 LOVE the heart from spools of vintage thread. Brings back great memories. Thanks for joining in on the party! I love your photos simple jet stunning. even a "heart hater" like me hearts these. =) happy vday, kindred. That's so pretty Jill. Thanks for sharing; I'm going to head over to check it out. Heart, Heart, Heart everyone's hearts! Your stash of spools of old thread must be wonderful. Hoarding has its rewards...once in a while anyway! Love the way you processed that last photo too! The simplest things are the sweetest, aren't they? This is THE cutest heart I have ever seen!! So happy I stopped by! 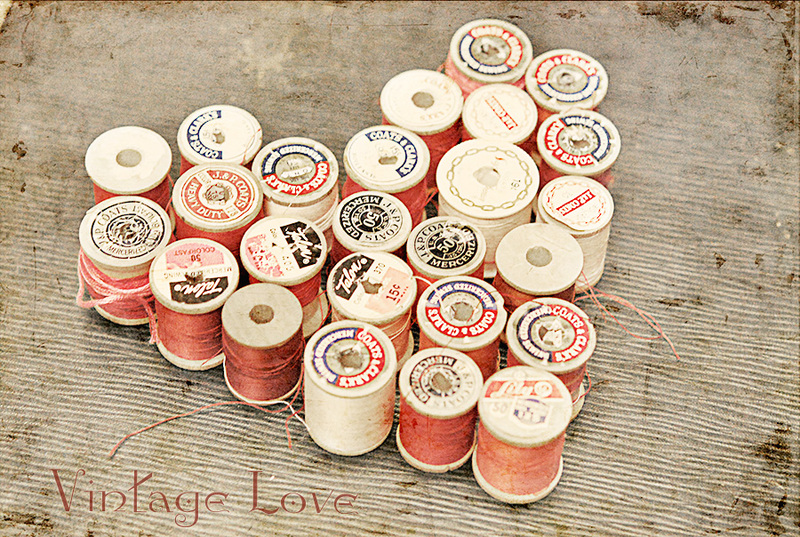 I love old thread like that and I love the way you used it for Valentine's. I have quite a bit of old thread that belonged to my grandmother. I may have to pull it out and play.